The country's services sector activity gathered momentum in February, driven by a quicker expansion in new work orders that supported a faster increase in output and job creation, a monthly survey showed Tuesday. The seasonally adjusted Nikkei India Services Business Activity Index rose from 52.2 in January to 52.5 in February, indicating an upturn in output. The services PMI was in the expansion territory for the ninth straight month. In PMI parlance, a print above 50 means expansion, while a score below that denotes contraction. New business received by services companies rose to a greater extent in February amid strengthening underlying demand, the survey said adding that the upturn in new orders in the services sector was domestically driven, as highlighted by a renewed contraction in external sales. According to Pollyanna De Lima, Principal Economist at IHS Markit, and author of the report, "Faster increases in new work and business activity supporting one of the best upturns in jobs for eight years." Meanwhile, the seasonally adjusted Nikkei India Composite PMI Output Index, that maps both the manufacturing and services industry, rose from 53.6 in January to 53.8, indicating acceleration in private sector activity in the country. "Indian economic growth strengthened halfway through the final quarter of FY18 to the second fastest since last July. The acceleration was driven by a thriving manufacturing sector, where production growth hit a 14-month high," Lima said. Lima further noted that manufacturing new export orders rose at a sharp rate against a backdrop of weakening global demand and trade frictions. When looking at other emerging markets, PMI data showed that the Indian goods producing industry outperformed those in Brazil, Russia and China by a considerable margin. Meanwhile price pressures waned as almost 97 per cent of panellists reported no change in their selling prices. The next meeting of RBI's Monetary Policy Committee is scheduled on April 2-4. Meanwhile, India's economic growth slipped to a 5-quarter low of 6.6 per cent in October-December period of 2018-19, mainly due to poor performance of farm, mining and manufacturing sectors, as per official data. Direct and indirect tax reforms will continue to facilitate and expedite the process of ease of doing business in India, finance minister Arun Jaitley said. The government is committed to facilitate trade and industry in the country so that the momentum of the growth continues to move up, Jaitley said while interacting with a delegation of the Federation of Indian Chambers of Commerce & Industry on Tuesday. He asked the Indian industry to comply with the recent recommendations of the GST Council with regard to reduction of rates of various items and pass on the benefits to consumers, the finance ministry said in a statement. Jaitley said the Insolvency and Bankruptcy Code has changed the credit culture in the country and is helping banks to make faster loan recoveries. He said GST is now on track and fast settling down. The thrust of the government is to lower the tax rate, increase the tax base and keep revenue collections moving up. Indirect tax collections will further increase in future, he told the delegation, according to the statement. Jaitley said India continues to be the sweet spot as far as foreign direct investment is concerned and is the fastest-growing economy. The government is committed to keep this growth momentum high and inclusive to ensure that the benefits reach all sections of society, he added. Speaking to reporters after the meeting, Ficci president Sandip Somany said the government promised to lower the corporate tax rate to 25% for all companies once the GST mop-up improves. The recent reforms ushered in by the government are creating new livelihoods across existing and emerging sectors, with eight segments of the economy alone expected to create over 10 crore (100 million) jobs by 2025, CII said Thursday. "With skill levels rising and substantial growth in startups and new businesses, the quality of jobs is being also enhanced, including through higher incomes," CII President Rakesh Bharti Mittal told PTI. According to Mittal, the measures to promote ease of doing business, cut in tax rates for smaller enterprises to 25 per cent, and reduction in interest rates are creating the right atmosphere for new businesses to flourish, particularly SMEs. The Confederation of Indian Industry (CII) expects eight sectors -- retail, construction, transport and logistics, tourism and hospitality, handlooms and handicrafts, textiles and apparels, food processing, and automotive -- to generate over 10 crore (100 million) jobs by 2025. The CII estimates construction sector to add about 2.87 crore (28.7 million) employment opportunities between 2015 and 2025, followed by retail and transport and logistics. Discussions at a recent CII workshop on jobs brought out that the number of startups can go up to 1,50,000 over the next two years from 60,000 currently. These new enterprises along with established tech-related enterprises and 63 million current MSMEs have the potential to enhance direct and indirect job opportunities by about 36 million over the next four years, according to CII. Union Minister for Commerce & Industry and Civil Aviation Shri Suresh Prabhu has said that the Indian jewellery industry plays an important role in the economy of the country. It accounts for 7% of GDP and 14% of merchandise exports and provides direct employment to 5 million people. To enable it to innovate and cater to the global market, it is essential to provide a suitable ecosystem. He was speaking at the foundation stone laying ceremony of India Jewellery Park, in Navi Mumbai today. The Minister expressed confidence that the industry will achieve the export target of USD 75 billion by 2025, up from the current figure of USD 42 billion annually. India Jewellery Park is an integrated industrial park with all facilities under one roof. The Park will have manufacturing units, commercial areas, residences for industrial workers, and commercial support services. "Mumbai is the largest exporter of gem & jewellery, accounting for USD 28,320.94 million (69% of India's total exports of gems and jewellery). India Jewellery Park, the first-of-its-kind Jewellery Park, will transform the jewellery industry in the state of Maharashtra and India", said the Chief Minister of Maharashtra, Shri Devendra Fadnavis. He further said that Jewellery Park will generate additional 1 lakh jobs in the sector. He also assured to provide a single-window system at the project site. He declared all possible help for Gem and Jewellery University and low-cost housing for artisans under PMAY. The State Government has always supported this labour-intensive sector and will continue to support it, said the CM. India Jewellery Park, Mumbai is a project of Gem & Jewellery Export Promotion Council (GJEPC). GJEPC will be entrusted to construct the Park as a Special Purpose Vehicle. The project is planned with a total project investment of Rs.14,467 crore (Rs.144.6 billion) including land, building and raw materials, which will generate an annual turnover to the tune of Rs. 41,467.50 crore (Rs.414.6 billion) under current market conditions, a major part of which will be for exports. India Jewellery Park is expected to enhance manufacturing, investment, export growth and overall economic development of Maharashtra and India. Minister for Industries & Mining, Government of Maharashtra, Shri Subhash Desai; Chairman, GJEPC, Shri Pramod Kumar Agrawal and other dignitaries were present on the occasion. The Gem & Jewellery Export Promotion Council (GJEPC) was set up by the Ministry of Commerce and industry, Government of India in 1966. It is the apex body of the gems & jewellery industry. Today, it represents over 6,800 exporters in the sector. With headquarters in Mumbai, the GJEPC has Regional Offices in New Delhi, Kolkata, Chennai, Surat and Jaipur, all of which are major centres for the industry. It thus has a wide reach and is able to have a close interaction with members to serve them in a direct and meaningful manner. Over the past decades, the GJEPC has emerged as one of the most active EPCs, and has continuously strived to expand its reach and depth in its promotional activities as well as widen and increase services to its members. Coffee shipments from India, Asia's third-largest producer and exporter, rose 13.26 per cent to 48,330 tonnes during the first two months of this calender year, according to the Coffee Board. The country had exported 42,670 tonnes in the year-ago period. India ships both robusta and Arabica varieties, besides instant coffee. As per the Board's latest data, the shipment of Robusta coffee jumped 28.42 per cent to 34,090 tonnes during January-February 2019, from 26,545 tonnes in the same period last year. Similarly, the export of Arabica coffee increased by 14.39 per cent to 11,156 tonnes, from 9,752 tonnes in the said period. The volume of coffee re-exported also remained higher at 13,392 tonnes, as against 11,516 tonnes in the said period. However, the export of Instant coffee showed a decline as volumes remained at 3,047 tonnes during January-February of 2019, when compared with 5,704 tonnes in the year-ago period. Italy, Germany and Russia were the major export destinations for Indian coffee during the period. Some of the major exporting companies include CCL Products India, Tata Coffee, Olam Agro and Coffee Day Global Ltd.
Coffee production is pegged higher at 3,19,500 tonnes for 2018-19 crop year (October-September), as against the final output of 3,16,000 tonnes achieved last year. Export of engineering goods in FY19 could cross the FY18 levels, said a senior official of EEPC India, here on Tuesday. India exported $76.2 billion engineering goods in 2017-18, said Mahesh K. Desai, Senior Vice-Chairman, EEPC India. He was briefing reporters about the eighth edition of the International Engineering Sourcing Show (IESS), to be organised by EEPC India, from March 14-16. Leading global and domestic engineering companies are likely to take part in the event. Desai said IESS is the largest engineering sourcing show in India. While Malaysia is the partner country, Flanders in Belgium is the focus region, for this edition. "As both Malaysia and India are moving towards a technology-driven automotive industry, equipped with shared mobility, connectivity, electrification and autonomous driving, this is an appropriate time for the Malaysia Automotive, Robotics and IoT Institute (MARii) to play a leading role in a global forum like the IESS," EEPC India said. According to C.H. Nadiger, Regional Director, Southern Region, EEPC India, all the exhibition space has been sold out and 400 domestic and overseas exhibitors will showcase their products at the event. While the main theme of the event is smart engineering, sub-themes are subcontracting, industrial and electrical machinery, future factory, and innovation and technology. Malaysian carmakers Perodua and Proton will also exhibit their models at the event. Perodua will also explore manufacturing opportunities here, said Sooraj Dhawan, Consultant, IESS. He said the company will also bring a delegation of its suppliers to the show. Indicative of the growing popularity of Japanese cuisine in India, food exports from the East Asian nation jumped 40 per cent in 2018. Even as it is working with various entities to further bump this up and has bestowed a government-authenticated tag on 36 fine diners. "Last year, Japan reached an agreement with India on the sanitary certificate of fishery products exported from Japan to India. Following this, in 2018, the export of Japanese food from Japan to India increased to about 1.3 billion Japanese yen (about Rs 833 million), which translates to a more than 40 per cent increase compared to 900 million Japanese yen (about Rs 580 million) in 2016," the country's Ambassador, Kenji Hiramatsu, told IANS in an interview. The Japanese government is currently working on increasing exports of agricultural products and foods to India and is engaged in discussions with Indian government agencies including the Food Safety and Standards Authority of India (FSSAI), Ministry of Agriculture & Farmers Welfare (MoAFW) and Ministry of Food Processing Industries (MoFPI), he said. "With FSSAI, we signed an MoU on food safety last October at the annual summit meeting, and are currently in discussions on improving the management system of food imports to India. With MoAFW, we are having discussions on exporting Japanese apples and pears to India," the ambassador said. For Japanese restaurants, he pointed out, "the availability of Japanese ingredients and drinks from Japan are essential. Therefore, in order to promote Japanese food in India, at the same time, we also need to work on the establishment of an ecosystem where Indian outlets can have easy access to Japanese ingredients and drinks. I will keep working on this important task furthermore". He also pointed out that until last year, the number of certified Japanese Food Supporters, a tag granted by the Japan External Trade Organisation to fine diners, was only one in India, but now, the number has dramatically increased and 36 are certified in India, including 16 which were certified in February. "I hope more Indian people will start visiting these restaurants and enjoy the taste of Japan," he said. How would he describe the role of food diplomacy in India-Japan ties? "I think we can understand each other's culture more in depth at the ground level by appreciating both Indian and Japanese food. You can also learn something about Japanese sensitivity and sense of beauty through Japanese cuisine. "Japan is a country with a highly refined food culture, and the Japanese people have traditionally enjoyed a rich variety of food gathered from the mountains as well as the sea. Japan has four distinct seasons, and in each of these four seasons, we can enjoy different kinds of agricultural produce and fresh seafood at their best," he said, adding that Japanese chefs are fully in tune with the seasons and use the freshest available seasonal ingredients to create Japanese cuisine. "Enjoying Japanese food also means learning about the Japanese people and their culture. Through cultural exchanges including food between Japan and India, I think we can enrich our lives and gain a better understanding of each other's country," the ambassador explained. How does he see the roadmap for the spread of Japanese cuisine in India? "Currently, we have some Japanese restaurants operating in major cities of India, such as Delhi, Mumbai, Bengaluru and Chennai, because of the increasing number of Japanese expats and also the growing awareness of Japanese food, especially among young Indians. We would like to reach out more to Indian people in these big cities first," Hiramatsu said. To further strengthen bilateral ties, India and South Korea have launched the India-Korea Startup Hub and Startup Grand Challenge. The Hub is hosted on the Startup India digital platform, the world's largest virtual incubator with over 300,000 registered startups and aspiring entrepreneurs. The Hub will enable access to resources for market entry and innovation exchange between India and the world. The hub was launched by the Prime Minister, Mr Narendra Modi, at the India Korea Business Symposium hosted by Invest India and Korean Chamber of Commerce and Industry (KCCI) in Seoul on February 21, 2019 during his visit. The Startup Grand Challenge, on the India-Korea Startup Hub, will channelise the entrepreneurial capacity between Indian and Korean startups to work together and build solutions for the challenges facing the world. Initial challenges will be focusing on issues across the themes of Credit Rating, Predictive Analytics, Fraud Detection, Cyber Security, and Primary/Secondary/Tertiary Healthcare. The State Bank of India and Mahindra Group will be mentoring, providing pilot project opportunities, and financial support of up to $ 50,000 to the winners. The applications for the Startup Grand Challenge are live on www. startupindia.gov.in/korea, said a release. Hoegh Autoliners has broken a record for transporting the heaviest break-bulk unit shipped by a RoRo vessel from India. The 107.4 MT generator was loaded in Ennore and will be used in a power generation plant project in Spain. Due to the concentrated weight and size ratio of the break-bulk unit, the Hoegh Autoliners' Operations team were put to the test. This was the single heaviest break-bulk unit handled so far on any RoRo vessel in India, said a release. Last year, the team had successfully transported a massive 94.3 MT mill shell from Mumbai to Dakar. With extensive experience in transporting heavy break-bulk cargo and a fleet of handling equipment to meet the task, the team quickly came up with a solution to use Hoegh Autoliners 30 feet rolltrailer which is specially designed to transport heavy cargo up to 160 MT. Hoegh Autoliners team visited the customer's factory to inspect the cargo and prepare a technical evaluation for handling the sensitive cargo. A solution was then developed by the Operations team for stuffing the cargo on to the rolltrailer. By rolling the break-bulk cargo on board the vessel, it reduces the risk of damage compared to lifting, ensuring a smoother and safer transport option. Under the supervision of Hoegh's Port Captain, the heavy break-bulk unit was stuffed securely on to Hoegh Autoliners' rolltrailer and loaded on board the vessel. Once inside, the generator was securely lashed on the main deck by an experienced cargo handling team, in accordance to Hoegh's detailed method statement. Stowing the cargo underdeck also ensures the sensitive cargo would not be exposed to seawater during the entire sea journey to Barcelona, the release pointed out. Said Mr Atuldutt Sharma, Breakbulk Sales Manager in India: "The customer was very pleased with our solution, as it provided them with a safe and cost-effective transportation option for their sensitive cargo. With the successful shipment, it is another example of how we use our team of experts specialised in handling complex break-bulk and project cargo to get the job done." Wan Hai Lines (WHL) India has announced a fixed-day direct service between China and Cochin called the China India Service II (CI2). It would facilitate a direct mainline call at Cochin for South-East Asia, the Far East and China, highlighted a statement. The port rotation is Qingdao-Shanghai-Ningbo-Shekhou-Port Klang-Cochin-Nhava Sheva-Tuticorin-Penang-Port Klang-Hong Kong-Qingdao. As per the statement, the maiden call at Cochin would be on April 9, 2019 with the arrival of Wan Hai 510 Voy.W119. * Direct service from China to Cochin with transit times from mainline China ports covering North, South and East China, providing a fast service for imports into Cochin and its hinterland. * Direct connections to Penang, Port Klang, Hong Kong and China ports. * WHL offers multiple sailings from Port Klang to various destinations, including Japan, Vietnam, Korea, Taiwan, Singapore, Thailand, Indonesia, Myanmar, the US West Coast and West Coast of Central and South America. * Improved and competitive transit timesfor the ex-im trade using Cochin Port. With this service, Wan Hai hopes to provide the capacity for import and export to the Far East and South-East Asia sectors required urgently by the trade, the statement added. India's containerised trade with the world has grown steadily, recording an overall import-export trade growth of 6 per cent* according to the Q4 2018 trade report released by Maersk, the world's largest container shipping company. Increasing demand for refrigerated cargo from India, coupled with improved trade relations with China with introduction of favourable trade policies, has driven exports to grow a healthy 3 per cent* in Q4. The demand for India-made goods such as vehicles, cereals and rice, supplemented by refrigerated cargo such as fish, seafood, vegetables and pharmaceuticals saw maximum growth in exports. Imports maintained a stable growth of 9 per cent*, largely driven by substantial inflow of metals and paper. Overall, the containerised trade witnessed stable growth, withstanding the fluctuations of global trade tensions, said a release. Commenting on the overall growth in containerised trade, Mr Steve Felder, Managing Director - Maersk South Asia, said, "We witnessed a stable trade environment in the last quarter of 2018, due to base effects, weakening demand of goods in China, overall contraction in manufacturing around the world and the global trade tensions between major economies. But the stable growth in trade indicates that the economy has been able to sail through some of these challenges, including the impact of regulatory reforms such as demonetisation and implementation of GST. We are witnessing an array of developments in the industry with regard to digitisation, consolidation and infrastructure upgrades which will support in propelling India as one of the top trading destinations in the world." Export growth from India was led by refrigerated cargo and agro-commodities, especially vegetables, seafood, fruits, nuts, cereals and rice exported to countries like China, the UAE, the US, the Netherlands and smaller nations like Algeria. Dry cargo exports remained flat this quarter, barring vehicles, which saw double-digit growth in volumes. As a consequence of favourable trade policies, China became one of the key export markets for refrigerated cargo. It also became one of the highest contributors to the country's export basket in Q4 with a 71 per cent* Y-o-Y increase. Import growth was led by dry cargo, metals, followed by paper and appliances and kitchenware which drove the volume growth. Commenting on the healthy growth of refrigerated cargo and agro products, Mr Ajit Venkataraman, Managing Director, APM Terminals Inland Services South Asia, said, "Unlike professional and large-scale farming observed in western countries, a majority of India's agricultural produce comes from small, rural producers based in the hinterlands. One of the most crucial challenges faced by the country's agriculture sector is food wastage, costing the industry billions of dollars every year. An efficient 'farm-to-fork' cold chain network managed by skilled workforce with refrigerated containers, temperature-controlled warehouses along the service trail, will help curtail this loss." The western region saw the highest growth of imports of dry commodities with strong growth in iron and steel scrap and electrical motors, while exports were largely driven by vehicle exports to Mediterranean countries like Egypt and Turkey. On the contrary, the northern region saw the highest growth of exports of dry commodities with plastic and rubber being the highest exported commodity. Chemicals saw a strong 6 per cent* growth in exports from the north India region. The highest commodity to see unprecedented growth was seafood, with fish being the highest exported commodity to China followed by a double-digit growth in exports to the US. Dry cargo like plastic, rubber, metal, and paper were among the most imported items in India in Q4. Iron and steel scrap were mostly imported from countries like the UK, Belgium and the Netherlands to the north and west of India. Furthermore, India also witnessed a 74 per cent* rise in its pharmaceutical exports to the US, the release said. Regional Container Lines (RCL) is continuing its expansion to serving smaller feeder type ports in India with a new service between Port Klang, Malaysia and Kolkata. Chana Bhum on an 18-day rotation. The maiden voyage by the Ora Bhum will be on 16 March from Port Klang. "RCL is already involved in the Indian main port trades through our cooperation with partners. This is an important milestone for RCL as it marks our second entry into the smaller feeder type ports in India, after Tuticorin," said Charlie Chu, EVP Business for RCL. "This service will serve our COC customers especially from South East Asia who have shipments to Calcutta, while same time serving our SOC customers who have encouraged us to start a service as well and serve their requirements. We expect the launch of this service to be well received in the market." The Department of Commerce of the Ministry of Commerce and Industry has notified a scheme for Transport and Marketing Assistance (TMA) for specified agriculture products, informed a release. i. The "Transport and Marketing Assistance" (TMA) for specified agriculture products scheme aims to provide assistance for the international component of freight and marketing of agricultural produce which is likely to mitigate disadvantage of higher cost of transportation of export of specified agriculture products due to transhipment and to promote brand recognition for Indian agricultural products in the specified overseas markets. ii. The scheme would be suitably included in the Foreign Trade Policy (2015-20). a. All exporters, duly registered with relevant Export Promotion Councils as per Foreign Trade Policy, of eligible agriculture products shall be covered under this scheme. b. The assistance, at notified rates, will be available for export of eligible agriculture products to the permissible countries, as specified from time to time. Eligibility of Products: The assistance will be provided on export of all agriculture products covered in HSN Chapter 1 to 24, including marine and plantation products except those mentioned in Annexure (1). (a) Assistance under TMA would be provided in cash through direct bank transfer as part reimbursement of freight paid. FOB supplies where no freight is paid by Indian exporters are not covered under this scheme. (b) The level of assistance would be different for different regions as notified from time to time for export of eligible products. List of export destinations/countries in each region eligible for assistance under TMA are mentioned in Annexure (2). (c) The assistance shall be admissible only if payments for the exports are received in free foreign exchange through normal banking channels. (d) The scheme shall be admissible for the exports made through EDI ports only. (e) The scheme covers freight and marketing assistance for export by air as well as by sea (both normal and reefer cargo). (f) For export of products by sea, TMA will be based on the freight paid for a full TEU containers. The assistance will not be available for (i) Less than Container Load (LCL) and (ii) a container having both eligible and ineligible category of cargo. Further, no TMA is available where the cargo is shipped in bulk/break-bulk mode. A 40' container will be treated as two TEUs. (g) Assistance for products exported by air would be based on per ton freight charges on net weight of the export cargo, calculated on the full ton basis, ignoring any fraction thereof. (h) The assistance will be provided at the rates as notified in Annexure (3). TMA would be reimbursed through the Regional Authorities of DGFT as per the procedure laid down in Chapter 7(A) of Handbook of Procedures (2015-2020). DGFT will lay down procedure for scrutiny of the claims, audit of the payments made, recovery of the ineligible/excess paid assistance, interest on such recoveries. The defaulters shall be liable for penal action under the provisions of Foreign Trade (Development and Regulation) Act, 1992, Rules and Orders made thereunder. M.V.CHIPOLBROK MOON docked at cargo jetty 15 at Deendayal Port on February 27, 2019 and discharged windmill blades and heavy packages. The vessel agent was Samsara Shipping and JR Roadlines Pvt. Ltd was the stevedore. The discharging operation was carried out successfully, highlighted a release. There was also export of steel plate machinery cargo and 34 pieces were loaded successfully. The export was to Vietnam and the import was from Portugal, the release added. The Port of New Orleans (Port NOLA) will be the host sponsor of the 2019 Journal of Commerce (JOC) Breakbulk & Project Cargo Conference, from April 29-May 2, 2019, at the Royal Sonesta New Orleans. "Breakbulk cargo has a rich history at the Port of New Orleans and remains a vital component of our overall growth," said Brandy D. Christian, Port of New Orleans President and CEO. "We are excited to partner with JOC to host a conference offering expert insight and industry analysis as attendees enjoy the vibrant sights and sounds of the Crescent City." The 2019 JOC Breakbulk & Project Cargo Conference will provide information that cargo owners can use to plan and execute shipments of breakbulk and project cargoes through US and international ports. At their core, all JOC events create value for beneficial cargo owners, including project owners, EPCs (Engineering, Procurement, Construction), OEMs (Original Equipment Manufacturers), steel and mining interests, and breakbulk shippers, through intensive programming that addresses key demands, and operational and strategic challenges facing cargo shippers as they navigate their transportation supply chains. "The original breakbulk conference began and was nurtured in New Orleans, and many who attended those events beginning in the early 1990s remember the unique combination of location, community and content that made them so special and unique," said Peter Tirschwell, Executive Director of Content for the Maritime & Trade division of IHS Markit, the parent company of JOC Events. "That's why we're delighted to be able to 'go back to the beginning' in restarting a breakbulk and project cargo conference in the heart of the French Quarter in one of the world's great maritime cities." The JOC is a leading industry publication and known for delivering top notch panels, keynote speakers and networking opportunities. This event will be content-rich covering key topics, including: demand outlook for energy, oil and gas, renewables, petrochemicals and commodities, tariffs, compliance and evolving supply chain, the state of the multi-purpose and heavy-lift fleet, steel and other commodities, sourcing and compliance strategies, and much more. In light of Port NOLA's host sponsorship, the port's annual Cargo Connections Conference will not take place in 2019 so the port can fully support the launch of JOC's Breakbulk & Project Cargo Conference in New Orleans. Event attendees will be able to take advantage of adding on to their trip to enjoy the New Orleans Jazz and Heritage Festival, April 25-28 and May 2-5, 2019, said a release. The Port of New Orleans (Port NOLA) is represented by Samsara Shipping Pvt. Ltd in India. The V. O. Chidambaranar Port Trust plans to develop two container terminals at the port soon. Speaking to reporters last week on the sidelines of a 'Shipping Summit' in which various stakeholders of the industry took part, the VOC Port Chairman, Mr T. K. Ramachandran, said that the port had seen an increase in container traffic while witnessing a downfall in bulk cargo traffic this year. In order to meet its projected traffic, the port had recently sought expression of interest from container terminal operators and shipping lines for developing berth IX as its third container terminal on an own, operate and maintain (OOM) basis for a period of 20 years, it was pointed out. Conversion of berth IX as a container terminal and construction of berth X would increase the existing total container handling capacity of the port from 1.01 million TEUs to 2.49 million TEUs. The projected requirement is 3 million TEUs by 2034-35. Meanwhile, in order to increase the dry bulk handling capacity, especially coal, the proposed plan includes upgradation of coal jetty 1, 11 and north cargo berth 1, mechanisation of NCB II and III (dredging would also be done in NCB III). This would take the coal handling capacity to 52 million MT while other dry bulk of 6 MMT can be handled. The port had registered a throughput of 12.48 million MT in 2017-18. The port has sufficient capacity to handle projected break-bulk and liquid bulk traffic, said the Vice-Chairman, Mr N. Vaiyapuri. 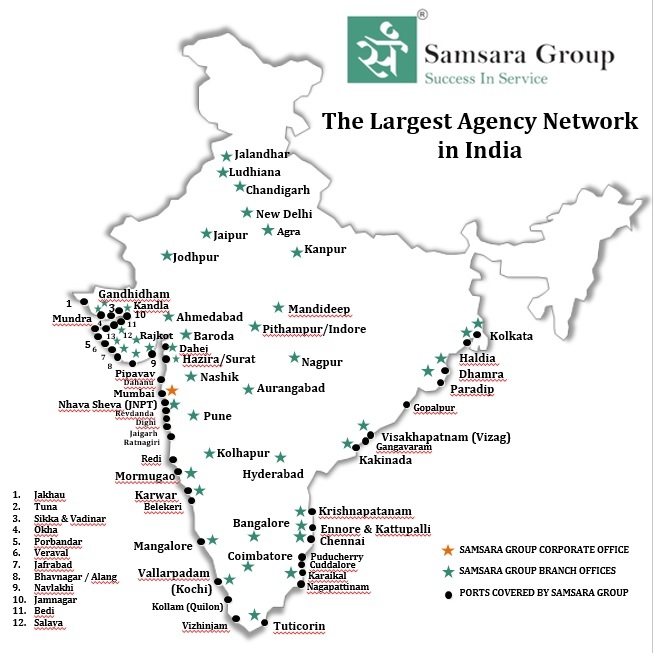 The Coastal Employment Unit, under the Sagarmala programme, is also on the anvil, through which a number of industries would be developed around the port, it was said. Besides, the entrance of the port would be widened from 153 m to 230 m.
Many industry stakeholders stressed on the importance of making the port a transhipment hub, implementing the Sethusamudram shipping canal project and improving rail connectivity. They said the port has to improve its infrastructure rather quickly in order to face the competition from other facilities in the vicinity, said a release. Above information is only indicative and given in good faith. We have collected the above information from various secondary sources. We have tried our best to be as correct as possible. However, we cannot guarantee 100 % accuracy in the above data. Our company / group will not be responsible for any mistakes / inaccuracies which might have crept in inadvertently.